Task Force Orion has left Afghanistan and they have built an enduring legacy for the Canadian Army. My colleague and I had a cigar with L Col Ian Hope, the task force commander, the night he left and we chatted about the way ahead and how we should be sorting out the Taliban. We also talked about Western Civilization, the works of Dr. Hanson (L Col Hope and I share the same enthusiasm for Dr. Hanson’s work), and the necessity of political will and the need for “heads on spikes”. I hated to see them leave. I really enjoyed working with L Col Hope and the Patricia’s. It was a tough tour for them. They were in contact with enemy forces pretty much every day they were in Afghanistan. They are one tired bunch and you can see it on L Col Hope’s face. Despite all the nastiness they had to contend with, they made me a part of them. L Col Hope and his staff bent over backwards to make me feel at home when I first reported for duty. They took my critiques and my advice to heart. As soon as the task force was able to they implemented the recommendations I made. These guys were willing to change procedures because they wanted to be the best and provide the most optimum conditions for their soldiers down range. I was born in Melita, Manitoba. If my family had stayed in Canada, I would most likely have joined the Canadian Army. I would like to think that I would have been assigned to the Patricia’s or a unit that is affiliated with them. After twenty years of service to the US Army Reserve and the Missouri National Guard, I was finally deployed to a shooting war. I thought it was provident that I was detailed to Task Force Orion and that I was able to fight alongside my former countrymen. I believe that was no coincidence. It has been a great honour serving with them. I will miss them dearly. Task Force Orion lost some good people. Volunteers all and from all parts of Canada, both regular and reserve, men and one woman. Here is the roll. On 2 March 2006 Cpl. Paul Davis, Bridgewater, Novia Scotia and Master Cpl. Timothy Wilson, Grande Prairie, Alberta were killed when their LAV collided with a taxi that failed to yield. Five other soldiers were injured including their interpreter. On 29 March 2006 Pte Robert Costall was killed in action defending a Forward Operating Base (FOB) in Helmand Province. Eight Afghan soldiers plus one US soldier died as well. He was born in Thunder Bay, Ontario and based in Edmonton with the 1st Battalion of the Princess Patricia's Canadian Light Infantry. He was married and the father of a baby boy. On 22 April 2006, four soldiers were killed when their G-Wagon struck an IED. Killed in the incident were Cpl. Matthew Dinning, born in Richmond Hill, Ontario, and stationed at Petawawa, Ontario, Lt. William Turner, born in Toronto, Ontario and stationed at Edmonton, Alberta, Bombardier Myles Mansell, born in Victoria, British Columbia and stationed at Victoria, British Columbia, and Cpl. Randy Payne, stationed at Wainwright, Alberta. On 17 May 2006, Capt. Nichola Goddard of Shilo, Manitoba, was killed in action when she was hit with an RPG. She was a Forward Observation Officer with the Royal Canadian Horse Artillery, Shilo, Manitoba. Her artillery unit deployed with the Patricia's. Goddard was the first woman in Canadian history killed in a combat role and the first female member of the Canadian military killed in combat since the Second World War. On 10 July 2006, Cpl. Anthony Joseph Boneca, a 21-year-old from Thunder Bay, Ontario was killed in action west of Kandahar City. He was on his second tour of duty in Afghanistan. He volunteered to serve with the Patricia’s for this deployment. He was a reservist from the Lake Superior Scottish Regiment based in Thunder Bay, Ontario. On 22 July 2006, Cpl. 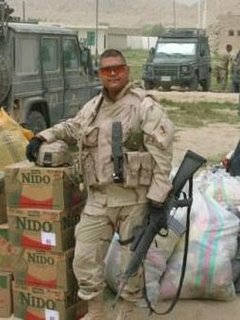 Francisco Gomez, 44, of the Princess Patricia's Canadian Light Infantry based in Edmonton, Alberta and Cpl. Jason Patrick Warren, 29, of Montreal's The Black Watch (Royal Highland Regiment) of Canada died when the Bison they were in was hit by a suicide bomber. Eight other soldiers were wounded in the attack. The supply convoy that they were a part of was returning from a supply run. On 3 August 2006, four Patricia’s were killed. Cpl. Christopher Jonathan Reid, 34, of Truro, Novia Scotia was killed when his vehicle struck a roadside bomb near Kandahar. Later on the same day, Sgt. Vaughan Ingram, 35, from Burgeo, Newfoundland and Labrador, Cpl. Bryce Jeffrey Keller, 27, of Sherwood Park, Alberta, Pte. Kevin Dallaire, 22, of Calgary, Alberta were killed in action supporting Afghan National Police clearing a suspected Taliban position in Zhari District. Three other soldiers were wounded in the RPG attack. On 5 August 2006, Master Cpl. Raymond Arndt, 31, of Edson, Alberta was killed when his G Wagon was struck by a civilian truck. He was a reservist with the Loyal Edmonton Regiment. Three others were wounded. They were delivering medical supplies to a FOB south of Kandahar City. On 11 August, Cpl. Andrew James Eykelenboom, 23, of Comox, British Columbia, was killed when his vehicle was struck by a suicide bomber. He was a medic based in Edmonton, Alberta with the 1st Field Ambulance. I will always remember the sacrifices Task Force Orion made. Task Force Orion made a positive impact in Afghanistan. Canada should be proud of what they accomplished. I know I am. Thank you for giving their names. Much gratitude goes to these fine Canandians for their role in the War on Terror. They took a great loss to defend the free world. I will ever be grateful and will hold them and their families in my prayers. Thanks Nighthawk for this great post. I have been working on a long tribute to our fallen Canadians in Afganistan. I will link you post, if you don't mind. My condoleance to the Americans for the tragic death of the courageous Sailor Damon Crooks. We are horified by the circumstances. He was murdered while trying to help. There is no word to describe our sorrow and anger.